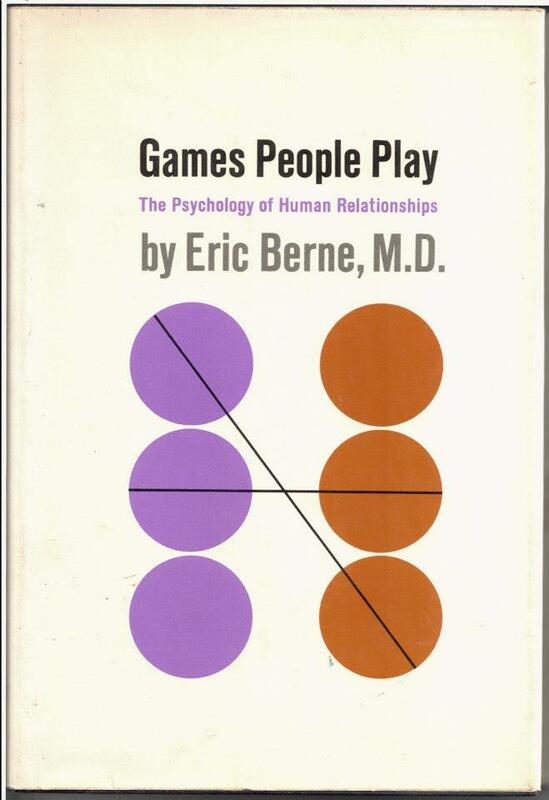 Original First Edition of Games People Play from Eric Berne’s private library. This game may be played in any professional situation and is not confined to psychotherapists and welfare workers. However, it is found most commonly and in its most florid form among social workers with a certain type of training. The analysis of this game was clarified for the writer under curious circumstances. All the players at a poker game had folded except two, a research psychologist and a businessman. The businessman, who had a high hand, bet; the psychologist, who had an unbeatable one, raised. The businessman looked puzzled, whereupon the psychologist remarked facetiously: “Don’t be upset, I’m only trying to help you!” The businessman hesitated, and finally put in his chips. The psychologist showed the winning hand, whereupon the other threw down his cards in disgust. The others present then felt free to laugh at the psychologist’s joke, and the loser remarked ruefully: “You sure were helpful!” The psychologist cast a knowing glance at the writer, implying that the joke had really been made at the expense of the psychiatric profession. It was at that moment that the structure of this game became clear. The worker or therapist, of whatever profession, gives some advice to a client or patient. The patient returns and reports that the suggestion did not have the desired effect. The worker shrugs off this failure with a feeling of resignation, and tries again. If he is more watchful, he may detect at this point a twinge of frustration, but he will try again anyway. Usually he feels little need to question his own motives, because he knows that many of his similarly trained colleagues do the same thing, and that he is following the “correct” procedure and will receive full support from his supervisors. If he runs up against a hard player, such as a hostile obsessional, he will find it more and more difficult to avoid felling inadequate. Then he is in trouble, and the situation will slowly deteriorate. In the worst case, he may come up against an angry paranoid who will rush in one day in a rage, crying: “Look what you made me do!” Then his frustration will come strongly to the fore in the spoken or unspoken thought: “But I was only trying to help you!” His bewilderment at the ingratitude may cause him considerable suffering, indicating the complex motives underlying his own behavior. This bewilderment is the payoff. The description of this game on this page is incomplete. For a complete description of this game, refer to Games People Play.